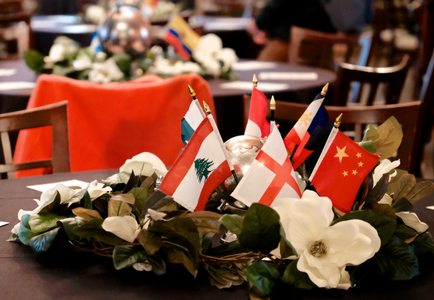 In conjunction with International Education Week, Wake Forest University School of Business hosted an International Student Celebration dinner Nov. 15. Students, staff, and faculty gathered in the Magnolia Room in Reynolda Hall to the sounds of festive music and the smell of delicious global cuisine. The festivities began with a welcome from Amanda Horton, senior associate director of integrative student services for the School of Business. The crowd gathered to enjoy the feast of international food, view an international student video, and hear remarks from Dean Charles Iacovou. The international cuisine included Asian, Latin, African, and Indian-inspired dishes of vegetable lo mein, egg rolls, fajitas, couscous, naan, and more. The dessert table featured delectable churros, baklava, rum raisin brownies, and coconut custard squares. “I want to try it all, everything looks and smells so yummy,” said Luna Zhou, an undergraduate accounting major, as she scooped an assortment of food onto her plate. 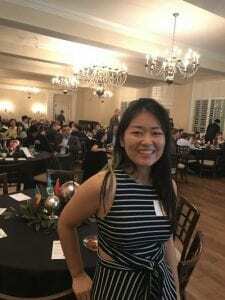 Zhou began her international education experience when she moved from Jiang Su, China to Asheville, North Carolina for her final year of high school. When it came time for college, she decided on Wake Forest and said that relationships with her professors have been her favorite part of her experience in the School of Business. 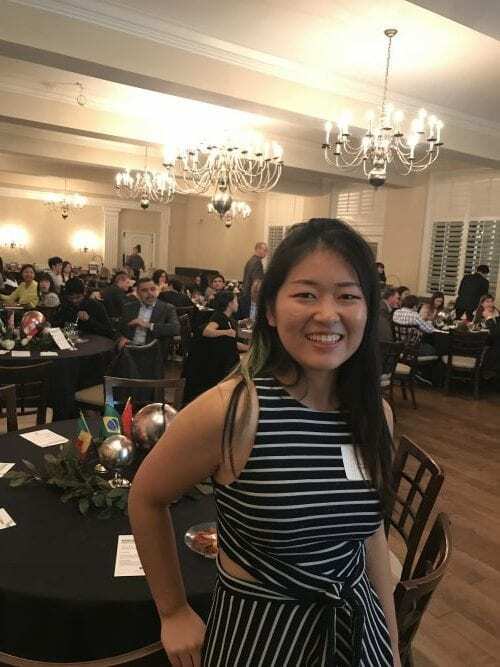 Zhou is just one of the many international students who gathered in celebration of their achievements and academic careers at Wake Forest, and the audience was able to hear similar student stories through the student spotlight video that debuted at the dinner. In the video, international students in the undergraduate and graduate programs shared their stories about gaining a global perspective in the School of Business. They discussed everything from finding their way around the area, to using their English skills, and even to fighting introversion. Dean Charles Iacovou ended the evening by reflecting on his own experience as an international student 20 years ago. “You make our education better, there is no doubt that the experiences that you bring to Winston-Salem and Wake Forest and the stories that you share about your journeys are creating a much richer and much more inclusive learning environment in the classroom,” Iacovou said. Two of our Master’s in Management students explain how being worlds apart doesn’t matter when you have so much in common.